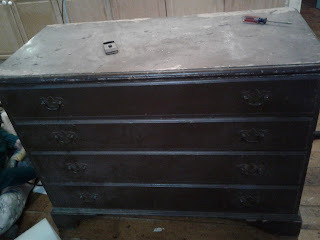 I picked this dresser up quite a while back and just recently had a chance to give it a make-over. When I picked it up, it had to be emptied first. 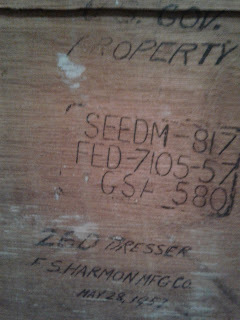 It was in a storage building and filled with heavy tools. I knew that although it was not cosmetically beautiful, it must be quite sturdy to hold that weight. At some point when it was moved the left rear leg broke off. 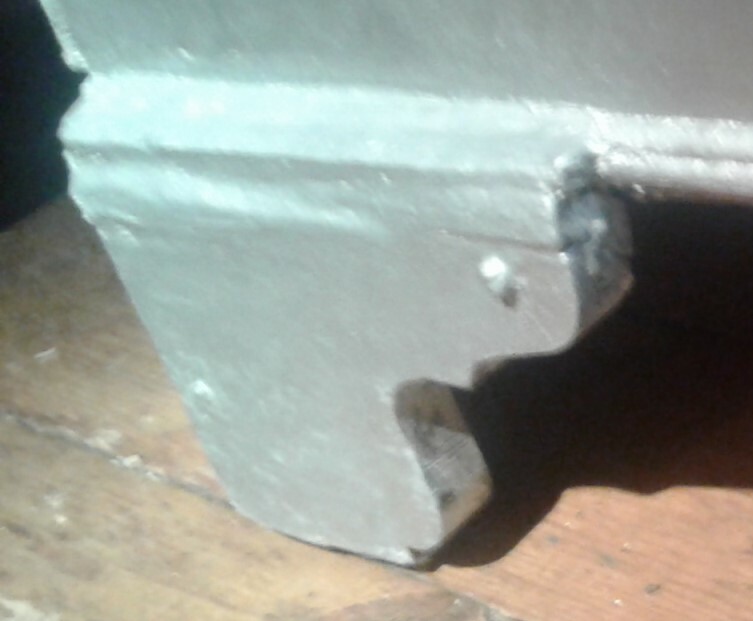 It had been repaired in the past and now would need to be repaired again. 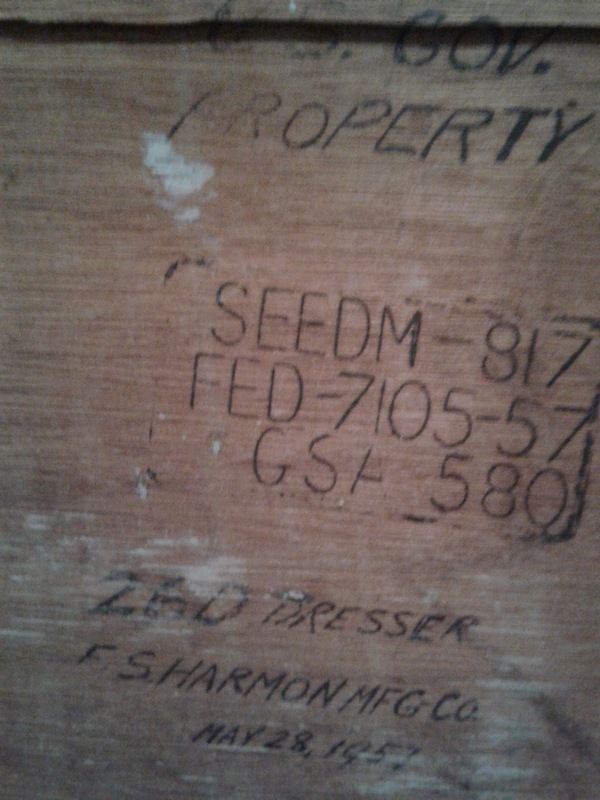 The dresser was painted dark brown and was dated 1957 and made in Tacoma, WA. At one time a lot of America's furniture was manufactured in Tacoma. 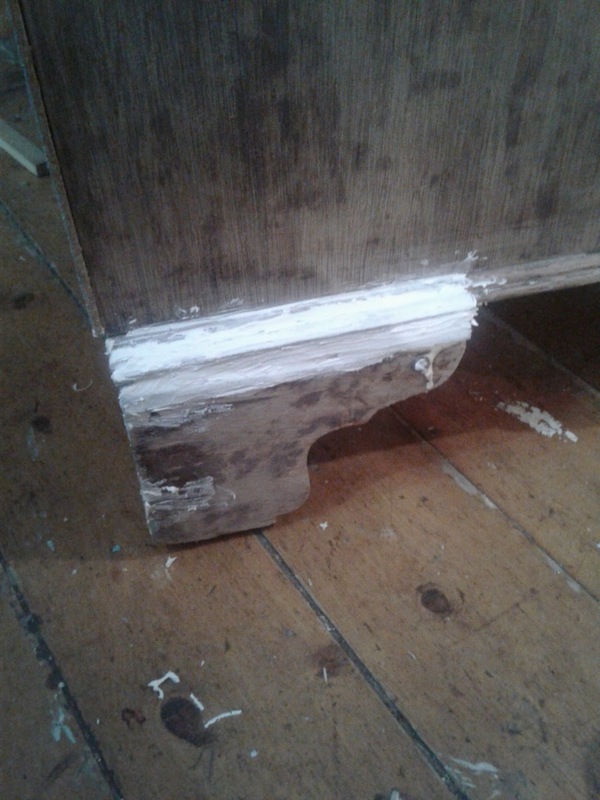 I am sure it was finished with stain and varnish at one time, but upon stripping it became apparent that painting this piece was the best option. As with a lot of pieces in this time frame it has thin sheets of real wood veneer. It needed to be reglued in places and it had many cosmetic flaws on the veneer. Surface flaws on veneer can be really hard to disguise because it is fairly thin and vigorous sanding can cause more damage. I believe the veneer is white oak and the grain was very uniform and not pretty at all. I glued and re-screwed the leg back on and added some wood pieces and some filler. This piece needed a glam look in order to make up for its flaws. 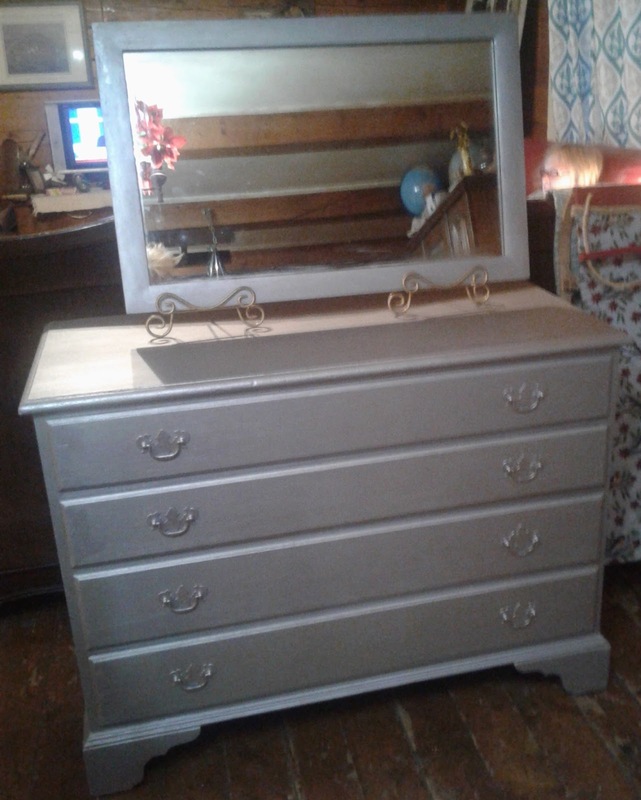 I decided on Rustoleum Metallic paint and I was very happy with it. This is an acrylic paint as opposed to an oil based paint. It went on smoothly and covered well. I also wanted to add some texture and extra fun, so I added high quality crystal glitter to the paint and to the top coat. It is subtle but the glimmer is there, and is especially visible on the top. I painted the handles with the same paint and topcoat. This will come with the mirror pictured. It is probably older than the dresser and very heavy. 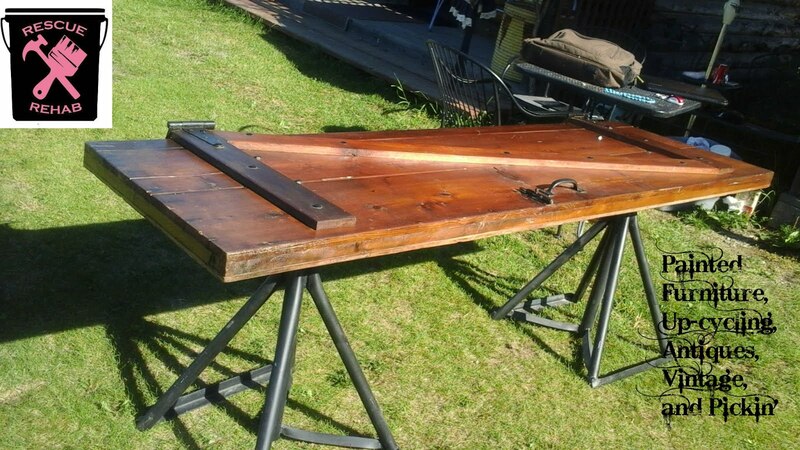 It will not come with the easels that are holding it up but it has picture hanging wire on the back and it can be hung vertically or horizontally. The dresser measures 44 inches across the front, 32 1/2 high, and 19 inches from front to back and will be available later this week. 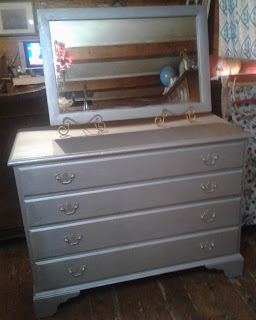 This would easily work well as an entry way piece, dresser, buffet for linens in a small dining room, or coffee bar!